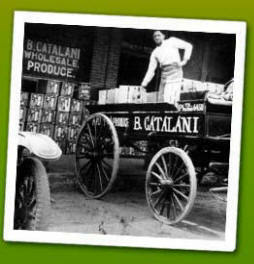 B. Catalani, Inc. dates back to 1888. As a young man, Blas Catalani was working for his father-in-law at Talerico Produce - Domestics and Tropical Fruit and Produce. With a true entrepreneurial spirit, Blas wanted to be the first distributor to bring lettuce to Texas by rail during the months lettuce could not be grown here. In 1914, B. Catalani Produce. was born, and became the first distributor to ship lettuce and other fresh fruits and vegetables on ice via rail from California, enabling his customers to purchase fresh fruits and vegetables year round. For nearly a century, the family has been working hard to carry out B. Catalani’s vision of being the premier provider of fresh fruits and vegetables to the customers it serves. B. Catalani’s longevity in the produce industry has led to more accurate forecasts, and impressive buying power as a result of many long-term relationships with growers. Today, we enjoy a customer base that includes retail and food service providers. Our success has led to several strategic partnerships to assist with the supplying of produce to our customers around the world. And, we stay connected in the industry through our memberships in PMA, and the Texas Produce Association. The success of B. Catalani has allowed the company to give back to the community. The leadership of the company recognizes the consumption of fresh fruit and vegetables is preventive maintenance for our health, and a way to fight the national epidemic of obesity. With a commitment of giving back to the community through Health and Wellness, B. Catalani has participated in several military outreach programs promoting the health and wellness that comes from the consumption of fresh fruit and vegetables. The company promotes the Presidential Health Proclamation, and is a regular contributor to the San Antonio Food Bank and Daily Bread.